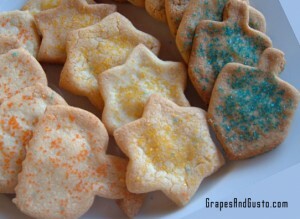 I couldn't help but display my Chanukah cookies instead of photos of wine...they came out so nicely! Combining family, food and festivities, Hanukkah is truly a holiday experienced through the senses. Add some wine to the mix with these tailored tips, and you’ll up the simcha factor faster than a spinning dreidel. With wine, it is important to relax and ultimately drink what you enjoy. Hanukkah’s treats and wintry backdrop provide just the occasion to experiment with food pairings. The first four tips offer advice on tasting and pairing. 1. Discover the new kosher wines. Gone are the days of kosher wines being synonymous with thick, syrupy concoctions (though these can get quite tasty during a four-cup seder). Today’s kosher wines, from Israel to the U.S. and even Australia, have begun garnering serious awards, and are redefining our concept of Jewish wines for the chagim. 2. Hanukkat Bayit. In Hebrew, Hanukkah means “rededication,” and what better way to celebrate this cozy festival of lights than to host a Hanukkah wine tasting with good friends, featuring – symbolically – eight wines for the group to try. 3. The new pairing theory. Did you know that the old “red wine with red meat, white wines with white meat” adage was born post-World War II, as an attempt by European wine promoters to target the steak-happy U.S. market? Some exceptions apply to that rule, such as the classic pairing of Pinot Noir and salmon, so modern wine specialists recommend pairing foods and wines that share equal heft or intensity of flavor, so as not to overwhelm one of the components. For example, chicken with herbs may be delicate enough for a white Chenin Blanc, but with a dark mushroom sauce, the chicken may be better suited to a red Beaujolais or Burgundy. 4. Wine’s yin and yang. Another simple pairing strategy is to take shared elements found in a food and a wine, and pair them in a complementary manner. Think of a crispy, fried latke and a buttery, oaked Chardonnay, both sharing a heavy richness on the tongue. An equally intriguing palate pleaser results from contrasting two elements – such as that hot, oily latke with a sip of crisp, clean Sauvignon Blanc, a delicate wine whose citruslike acidity cuts through the oil and cleanses the palate. While the true essence of Hanukkah hardly emphasizes presents, it helps to have a plan for purchasing wines for a special friend, colleague or hostess. These next four strategies will keep your gift in their hearts long after the eighth candle has waned. 5. Pick a relevant region. Today, all 50 states make wine. If you have a loved one who will be visiting from New York, for example, why not give them a bottle of fine, red Meritage from the North Fork of Long Island? 6. Mark a meaningful year. Perhaps your niece got engaged in 2003. Why not track down a case or a magnum (large-format bottle) of a rich Cabernet Sauvignon from that vintage year? 7. Hone in on a hobby. With an abundance of clever winery names and creative labels available, this is one time when judging a book by its cover is encouraged. There are wine labels with favorite animals, tongue-in-cheek humor or even a sultry bottle of Marilyn Merlot for the fans. 8. Bundle wines from Israel and the Diaspora. Give a multiple gift by selecting the recipient’s favorite type of wine and gathering an Israeli version along with one from the U.S., Australia or Europe. Call this the “Nes Gadol Haya Po v’Sham” gift: A great miracle happened here and there! Spanning the globe and various budgets, here are three kosher wines that pair smartly with Hanukkah fare. The signature citrus and gooseberry flavor combination put Marlborough, New Zealand, on the world map for notable Sauvignon Blanc production, and this example is just that – and perfect as a crisp contrast to hot latkes. The full-bodied fruit and creamy oak essence lend a vibrant touch to this classic white sipper. With an exceptionally rich structure, this Australian landmark wine can easily complement any oil-laden Hanukkah treats. Gilat Ben-Dor, MBA, CSW is a wine educator and sommelier. She is the director of Renaissance Wine Academy™ in Scottsdale, Arizona, which offers wine education, keynote speaking, and consulting for corporate and private clients. Visit RenaissanceWineAcademy.com for more details.